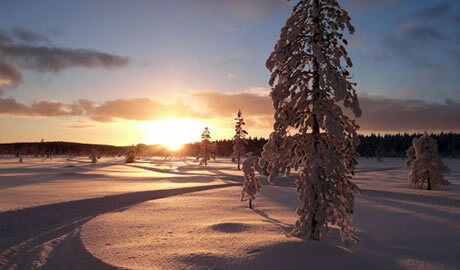 Arrange your international flight to arrive in Kajaani, Finland today. (You use the airport code KAJ when searching for flights to/from Kajaani). All flights to Kajaani, in central Finland, connect through Helsinki, but an overnight stop in Helsinki is not a part of the tour unless you decide to spend some time there on your own before or after the tour. Arrange your flights to arrive in Kajaani no later than mid-afternoon today. 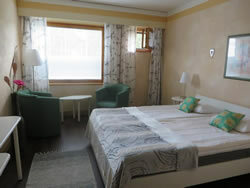 Upon arrival in Kajaani you will be transferred to our hotel in Kuhmo. We will have a cocktail and introductions beside the hotel’s fireplace before heading into our Welcome Dinner. Enjoy a leisurely morning. Today we will be engaging in friendly competition with one another in teams, as we hone our skills at winter survival games. The challenges will be fun and all done in the spirit of camaraderie. Go Team Toto! In the afternoon, you are free to enjoy the saunas and the indoor and outdoor jacuzzis. You may also want to try out the peat sauna, which has you getting dirty to get healthy. Peat is a 100% natural product, drawn from underground where bioactive ingredients have been combined and formed a substance with minerals. Traditional peat treatments include body masks, facial masks, leg and feet treatments as well as procedures on back, neck and shoulders. These treatments are often combined with sauna sessions so that the heat of the sauna can speed up the processes. After dinner, our DJ will guide us through the evening. 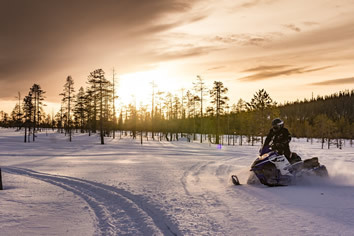 After a late breakfast, we ride on snowmobiles across Finland’s snowy landscape. 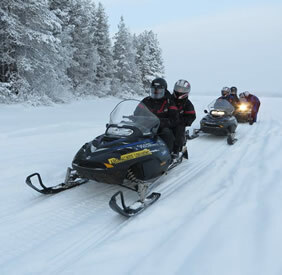 An experienced guide will give us a lesson on how to operate the snowmobile and provide safety information. 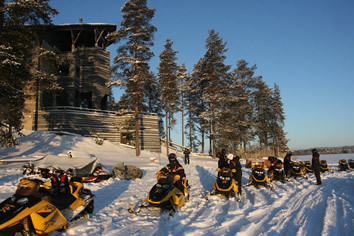 Then you and another person will hop aboard and embark on 2-hour thrill-ride across the snow and along the taiga forest. The afternoon is free for relaxation. This evening, we enjoy a special dinner in “Kota” teepee at the lakeshore, enjoying a tasty reindeer meat dish around an open fire. Finally, we luxuriate in saunas and jacuzzis and get a classic Finnish sauna treatment with birch branches. After breakfast, we head to a nearby husky farm. 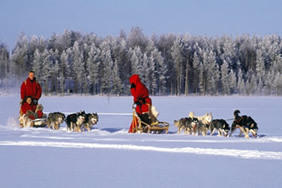 First, we learn about the life of the sled dogs in the arctic areas and get acquainted with the happy animals. We are given safety guidelines and a driving lesson before embarking on a husky safari with two people on each team. After the safari, we have a picnic lunch at the farm. In the afternoon, you will have time to relax in the sauna or sign up for optional spa treatments. Tonight’s dinner includes traditional tastes of this region of Finland. This morning, we embark from our hotel on an energetic and perhaps comical walking tour, as we see how graceful we can be wearing snowshoes. Afterwards, our tour guide shows us how to do winter ice fishing out on the frozen lake. We will have time for sauna and relaxation in the afternoon. 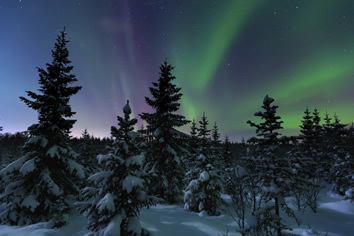 This evening we experience “Finnish Mystical Magic”, as we walk (on snowshoes or on foot, depending on snow level) into the forest to meet a shaman. She will offer you love potions and Deer Antler Velvet, and she will predict your future. The main course at dinner tonight will be a special delicacy: bear meat. Finally, you can wow the crowd with karaoke at our hotel’s restaurant. After breakfast we go to cross-country ski school to learn the national sport of Finland. 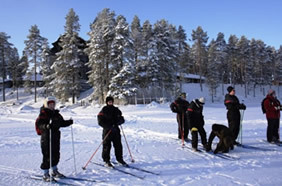 After lunch enjoy plenty of free time to continue skiing on easy tracks at the Kalevala Ski-centre and along the lakeshore. Ski tracks for persons with more experience are available as well. Sauna time before dinner which features cuisine from the Baltic-Finnic ethnic group, the Karelians. Afterwards, a DJ entertains with dancing until the early hours. Our last full day here is completely free for leisure, to enjoy the snow, have spa treatments, or to repeat some of the winter activities you enjoyed most (optional, not included). One that we haven’t experienced so far, and which will be a Toto challenge, is an exciting float/swim down the Pajakkakoski rapids in the center of Kuhmo! The glow of accomplishment and a hot toddy served in a tepee below the rapids will be your reward! In the evening we get wild and dispense with proper etiquette, white tablecloths or fancy cutlery. Our "Olden Days” Farewell Dinner is all about eating the way locals have done for centuries – with your fingers or wooden spoons. The tour concludes after breakfast. We check out of our hotel and transfer to the Kajaani Airport (airport code KAJ) for our return flights home, which connect through Helsinki. • Camera fees; laundry, telephone calls, faxes, or any other expenses of a personal nature. • Tipping guidelines for our group tips will be provided prior to departure. • It is possible to arrive a day early or depart a day later. Extra nights start from $100 per person, including dinner and breakfast. • Winter gear (thermal overall suit, hat, gloves, socks, boots) can be rented for $80 for the week. This must be booked in advance with clothing and shoe sizes provided. • A driver’s license is required to drive a snowmobile. • We reserve the right to change the order or content of the program if necessary due to the weather or other conditions. 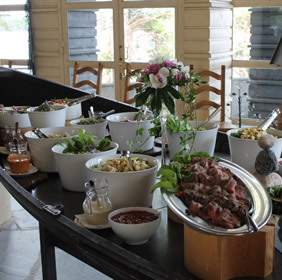 Hotel Kalevala lies on the shore of Lake Lammasjärvi, and offers free WiFi in the main building, a gourmet restaurant with lake views and a variety of activities for guests. 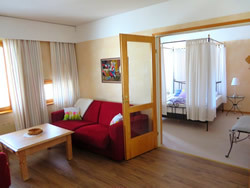 Each guest room at Hotel Kalevala includes a seating area and satellite TV. Many rooms face the lake. Hotel Kalevala's wellness area offers 4 saunas, 2 hot tubs and various massage facilities and treatments. 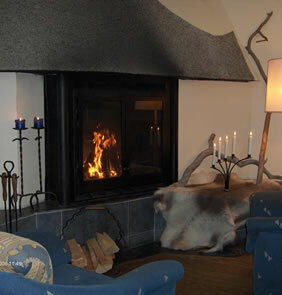 Other facilities at Hotel Kalevala include a lounge with fireplace and a bar. In summer, meals can be taken out onto the terrace. The nearby beach has a barbecue area. 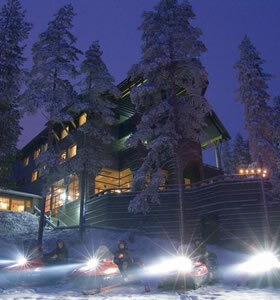 Hotel Kalevala provides organised activities such as husky safaris, guided snow mobile,and ski trips. During Christmas, guests can take part in Santa Claus Adventure walks. For citizens of the United States and Canada, all you need to enter Finland is a valid passport. No immunizations are required, but it is wise to have a current tetanus booster. Your airport departure tax will be included in the cost of your international airline ticket. On this tour, international airfare is NOT included. You will need to get your international air to Kajaani, Finland (airport code KAJ), and back from there to the Home. You need to arrive in Kajaani by the afternoon of Saturday, February 1, 2020. 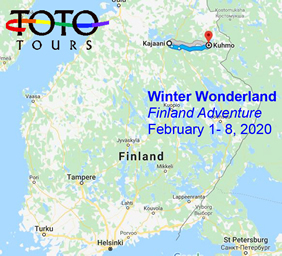 Your departure from Kajaani will be on Saturday, February 8, 2020.